Can I use this design on items that I sell? 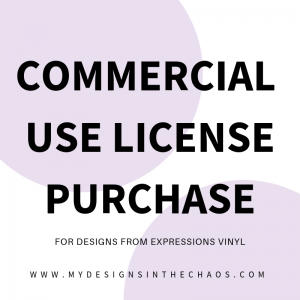 All of the designs in our shop and on our blog are available for personal or commercial use up to 200 uses. This means that you can use the design to create a finished product for a customer and sell it to them. The item has to be made in your own home by you. We do not allow outsourcing of our designs or digitizing of our designs. If you have questions or need clarity please feel free to let me know. Thanks! I have downloaded my file…Where did it go? Find the folder on your computer titled downloads. You will see the zipped file. Unzip the file and drag and drop it to the folder you would like to store it in. I can’t unzip my file…. Help! Once the folder is downloaded, open the zipped folder. Drag the folder inside from the zipped folder to a new spot on your computer. To unzip all the contents of the zipped folder at once, press and hold (or right click) the folder, select extract all, and then follow the instructions on your screen. Once the folder is downloaded, double-click on it. Archive Utility should appear and automatically extract your files. How do I open the SVG? Locate the file you want to open. After locating and selecting the file, it should open seamlessly into Silhouette Studio. 2) which version of Studio do you have? Open Design Space and go to “File > New” This will open a new design screen. From the sidebar, click Upload Image. On the new screen go to “Upload > Browse” and locate the SVG file you want to open. Double click on it. Click the file in the Upload Image window to select it. Your file will show a green check mark when correctly selected. Click Insert Images and your SVG file should now be visible on your canvas. How do I place a custom design request? While I don’t do custom orders I do have an ongoing list of design suggestions that I work from and would love to hear from you! If you have something specific you are looking for: ‘Nana is the greatest Nana EVER’ for example you can shoot me the suggestion in an email through our contact form. Please Note: These are SUGGESTIONS ONLY and not a commitment to creating the requested file. Don’t have an exact design but just a general theme you would like to see? Please feel free to send it over. I would love to add your suggestions to the mix.